It’s arrived – real smartphone integration for your car. 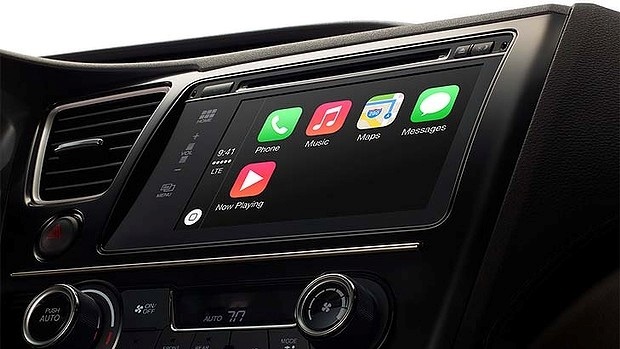 Apple unveiled CarPlay at the Geneva 2014 Auto show and the Internet came alive with criticism, speculation, and a palpable buzz of excitement. Will it revolutionise tasks on the go? Could driving ability suffer from increased distraction? Is Apple taking over our cars? Will cars soon sprout wings and fly away? We’d rather leave the technology debates to the experts. Today we’ll give you a quick run through of the features of CarPlay, and what this could mean for drivers like you on Australian roads. CarPlay comes as part of the iOS 7 package that Apple announced in 2013. You can plug your device in, and CarPlay connects with the in-car entertainment system. CarPlay is then visible on your built-in display. You can access most of the basic functions of your iOS device from the in-car entertainment system. You can control CarPlay using voice (through Siri) or touch (through your in-car entertainment system buttons). This negates the need to squint at a small iPhone screen or maneuver the tablet in the car. You should be able to send texts, read texts, view iPhone maps, make calls, and change the song with your voice. At the moment, the iTunes music support is the real kicker – you can browse by artist, album, genre and track on your dashboard. Right now, CarPlay supports Apple Maps, iTunes music, and calls and text. There will be more apps to come but we suspect approval could be a lengthy process. Apple will be stricter on CarPlay apps than apps found in the app store. Car makers will also have the power to approve or veto apps. Which car models are supported? CarPlay is available in 2014 models from Honda, Hyundai, Mercedes-Benz, Volvo and Ferrari. Future models from BMW, Chevrolet, Ford, Jaguar, Kia, Land Rover, Mitsubishi Motors, Nissan, Opel and PSA Peugeot Citroen will also support CarPlay. What about me? I have an Android! Don’t worry; we haven’t forgotten our friends on Android. A few months ago Google announced a similar piece of tech: Google’s Open Automotive Alliance. The android supporting system has received much less media fanfare, largely due to its fledgling status. Google announced Open Automotive Alliance a few months ago and is yet to receive a media demonstration. We can speculate that the features will be like that of CarPlay. What do you think? Great innovation or just another distraction?